... is a state-of-the-art SLAM system for RGB-D cameras, e.g., the Microsoft Kinect or the Asus Xtion Pro Live. You can use it to create 3D point clouds or OctoMaps. 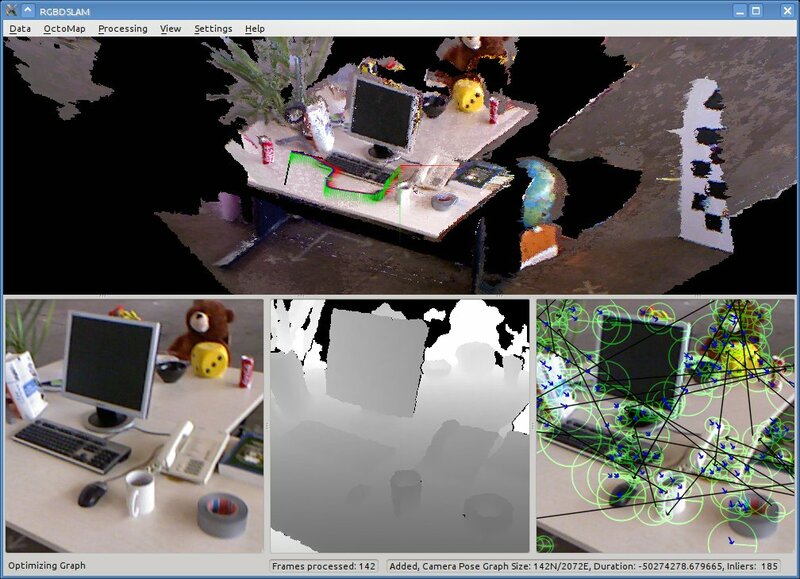 RGBDSLAMv2 is based on the open source projects, ROS, OpenCV, OpenGL, PCL, OctoMap, SiftGPU, g2o, and more - Thanks! IEEE Transactions on Robotics, 2014. Amd64 processor (there are known problems with ARM, mostly related to qt and opengl) Other versions may work, but are not tested. Please report success if you use other versions. This is a canonical way, feel free to adapt if you known what you are doing. Put RGBDSLAMv2 in a catkin workspace: See the catkin tutorial for details. Use git to clone this repository into your workspace's "src/" directory. Or download RGBDSLAMv2 as an archive and extract it to "src/". Download my [g2o fork|https://github.com/felixendres/g2o], put it in some other directory. Build and install. Export the environment variable $G2O_DIR to the installation directory to let rgbdslam_v2 know where to find it (see Installation from Scratch for an example). To build RGBDSLAMv2 go to your catkin workspace and execute "catkin_make". If you get an error about the missing siftgpu library, execute "catkin_make" again. There is now an install.sh script, which can be executed (bash install.sh). It installs everything required below ~/Code (you can change the location in the script). The script is short and not complicated, so you can also use it as a manual. If you want to use the install script, it is sufficient to download it directly. There is no need to clone this repository then, as the script will do that for you. If you have a multi-core machine with 4GB RAM or more, you can speed up the compilation by increasing the two occurences of "-j2" to, e.g., "-j4". Check out the launch files in "launch/" for examples and specific use cases. roslaunch rgbdslam openni+rgbdslam.launch is a good starting point for live mapping. You probably need to adapt the parameters for the input topics depending on your camera driver node. Check out the README in "test/" for running, testing and evaluating RGBDSLAMv2 on Juergen Sturm's RGB-D SLAM Dataset and Benchmark: http://vision.in.tum.de/data/datasets/rgbd-dataset You need cython for the evaluation scripts (sudo apt-get install cython). If you want to use SURF or SIFT, you will need to build OpenCV from source, including the non-free module (this does not include SIFTGPU, which is included, but needs to be enabled in CMakeLists.txt). In the CMakeLists.txt of RGBDSLAMv2 you can set the build directory of OpenCV and enable the non-free functionality. Note that SIFT and SURF are not the best choice. Due to new (software) features in RGBDSLAMv2, ORB outperforms both. This software is an update of the ROS Fuerte version of RGBDSLAM. However many things have changed, so some of the DOCUMENTATION BELOW MAY BE OUTDATED. Please report problems with the documentation. Thanks. There are several example launch-files that set the parameters of RGB-D SLAM for certain use cases. For a definitive list of all settings and their default settings have a look at their quite readable definition in src/parameter_server.cpp or (with the current settings instead of the default) in the GUI Menu Settings->View Current Settings. The various use-case launch-files might not work correctly yet, as they are not regularly tested. You should get them running if you fiddle with the topics ("rostopic list" and "rosnode info" will help you. "rqt_graph" is great too). 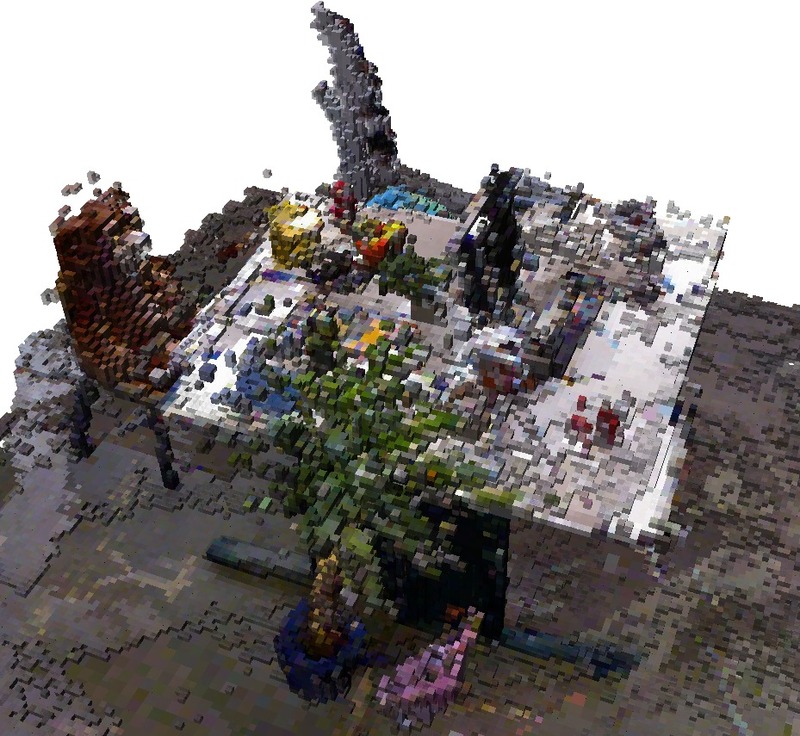 Most people seem to want the registered point cloud. It is by default sent out on /rgbdslam/batch_clouds when you command RGB-D SLAM to do so (see below). The clouds sent are actually the same as before, but the according transformation - by default from /map to /openni_camera - is sent out on /tf. The octoMap library is compiled into the rgbdslam node. This allows to create the octomap directly. In the GUI this can be done by selecting "Save Octomap" from the "Data" Menu. Online octomapping is possible, but not recommended. To capture models either press space to start recording a continuous stream or press enter to record a single frame. To reduce data redundancy, sequential frames from (almost) the same position are not included in the final model. Parameters RGBDSLAMv2 is customizable by parameters. These should be set in the launch file. Parameters can be changed during operation from the GUI, however, changes from the GUI may have no effect for many parameters. Visualization The 3D visualization shows the globally optimized model (you might have to click into it to update the view after optimization). Neighbouring points can be triangulated except at missing values and depth jumps. With the shortcut "t", triangulation can be toggled. Since raw points render slightly faster the parameter "cloud_display_type" controls whether triangulation is computed at all - at the time the cloud is received. The parameter "gl_point_size" may be useful to most users. The compilation may take a lot of memory, particularly if the environment variable $ROS_PARALLEL_JOBS is set. If you have questions regarding installation or usage of RGBDSLAM please refer to http://answers.ros.org/questions/?tags=RGBDSLAM For further questions, suggestions, corrections of this README or to submit patches, please contact Felix Endres (endres@informatik.uni-freiburg.de). Apart from this manual, code documentation can be created using rosdoc ("rosrun rosdoc rosdoc rgbdslam"), which will create a "doc" folder in your current directory. If there are problems related to the compilation or linking of GICP or SIFTGPU, you can deactivate these features at the top of CMakeLists.txt. You might get even faster GPU features setting the parameter "siftgpu_with_cuda" but you will need to install the proprietary CUDA drivers that may require a NVidia GPU (see http://www.nvidia.com/object/cuda_gpus.html). For installing the development drivers and the CUDA SDK you can use the following tutorial: http://sublimated.wordpress.com/2011/03/25/installing-cuda-4-0-rc-on-ubuntu-10-10-64-bit/ or for ubuntu 10.04: http://ubuntuforums.org/showthread.php?t=1625433 (tested on Ubuntu 10.04 x64) To use SiftGPU you should install "libdevil-dev". Additional compiling information can be changed in external/siftgpu/linux/makefile. If you get an error that the siftgpu library is not found, execute "make" manually in the directory external/siftgpu/ and rerun catkin_make. RGBDSLAM is licenced under GPL v.3. See the accompanying file "COPYING". If you want to use RGBDSLAMv2 with an RGB-D camera you may have to install openni (sudo apt-get install ros-indigo-openni-launch). Problems may occur when using a version of the PCL library different from the ROS hydro version. To build RGBDSLAMv2 go to your catkine workspace and execute "catkin_make". If you get an error about the missing siftgpu library, execute "catkin_make" again. If you want to use RGBDSLAMv2 with an RGB-D camera you may have to install openni (sudo apt-get install ros-hydro-openni-launch). If there are problems related to the compilation or linking of GICP or SIFTGPU, you can deactivate these features at the top of CMakeLists.txt. You might get even faster GPU features setting SIFT_GPU_MODE to 1 (CUDA) but you will need to install proprietary drivers: SiftGPU uses (in our case) CUDA, which needs a new NVidia GPU (see http://www.nvidia.com/object/cuda_gpus.html). For installing the development drivers and the CUDA SDK you can use the following tutorial: http://sublimated.wordpress.com/2011/03/25/installing-cuda-4-0-rc-on-ubuntu-10-10-64-bit/ or for ubuntu 10.04: http://ubuntuforums.org/showthread.php?t=1625433 (tested on Ubuntu 10.04 x64) To use SiftGPU you should install "libdevil-dev".